People are starting to talk because the sci-fi austerity of Future Politics feels like less of an exaggeration than it should. Its dystopia is less the dismal Blade Runner environment we typically associate with the word and more the invisibly sinister, pacifying beauty found in films like Her. It’s a fitting application of Austra’s icy electropop and a natural evolution from its house-influenced sophomore effort, Olympia. Sometimes the album’s polished production and predictable structures seem to undermine its radical message. But rather than pushing its agenda at the fringes, this record aims to infiltrate and change from within, for the most part using catchy hooks and accessible structures to ask a wider audience to think bigger. There is some interesting experimentation, like in the mutating swing of “I’m A Monster,” but sonically, it’s in Stelmanis’ unorthodox vocal phrasing and acrobatics, her striking harmonies throughout, that Austra and Future Politics find true subversion. It’s especially powerful that Future Politics would ask us to engage with its big ideas on the dance floor, itself a powerful place of transgression and revolution. The dance floor is a safe haven and, Orlando reminded us, still a life-and-death outlet for many. Facing down certain political retrograding, it’ll be a place and a headspace as important as ever. 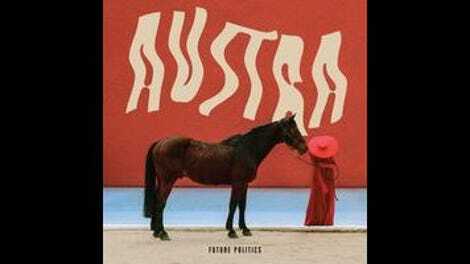 Austra’s optimistic and propulsive record is a welcome accompaniment. Purchase Future Politics here, which helps support The A.V. Club.